Young M.A. & KorLeone team up for the “Wahlinn” music video. It’s been two years since Young M.A’s hit single, “Ouuu” came out but fans are eagerly waiting for the Brooklyn rapper to release her debut album. Last year, she dropped off her EP, Herstory but throughout this year, she’s been dishing out a lot of dope one-off singles. To kick off the fall, Young M.A. released her single, “Wahlinn” with KorLeone this past weekend. Now, she serves up an official music video for the track. 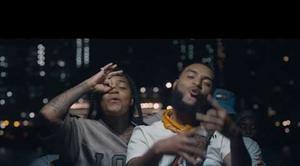 Young M.A showed off a different side of her artistry on her melodic new single, “Wahlinn” and now, she drops off a new music video for the song. Her and KorLeone are seen riding on jetskis through the NYC waters with the Statue Of Liberty in clear sight. Afterwards, she and KorLeone are posted up with some baddies and their homies in front of the New York City skyline while they pop bottles and flex their wads of cash. Throughout the course of the summer, Young M.A dropped off a few massive singles. At the top of July, she came through with her single, “Petty Wap” and dropped off the pool party themed music video the following week. In August, she released “Car Confessions. Hopefully, we’ll be getting her debut album soon. Tags: Herstory, KorLeone, Music Videos, new single, new video, new york city, News, upcoming project, young m.a.